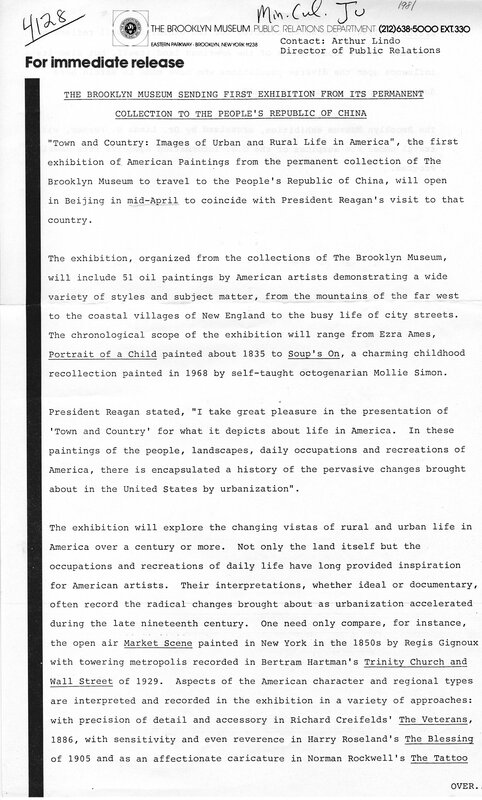 April 28, 1981 "Town and Country: Images of Urban and Rural Life in America”, the first exhibition of American Paintings from the permanent collection of The Brooklyn Museum to travel to the People’s Republic of China, will open in Beijing in mid-April to coincide with President Reagan’s visit to that country. The exhibition, organized from the collections of The Brooklyn Museum, will include 51 oil paintings by American artists demonstrating a wide variety of styles and subject matter, from the mountains of the far west to the coastal villages of New England to the busy life of city streets. The chronological scope of the exhibition will range from Ezra Ames, Portrait of a Child painted about 1835 to Soup’s On, a charming childhood recollection painted in 1968 by self-taught octogenarian Mollie Simon. President Reagan stated, “I take great pleasure in the presentation of ‘Town and Country’ for what it depicts about life in America. In these paintings of the people, landscapes, daily occupations and recreations of America, there is encapsulated a history of the pervasive changes brought about in the United States by urbanization”. The exhibition will explore the changing vistas of rural and urban life in America over a century or more. Not only the land itself but the occupations and recreations of daily life have long provided inspiration for American artists. Their interpretations, whether ideal or documentary, often record the radical changes brought about as urbanization accelerated during the late nineteenth century. One need only compare, for instance, the open air Market Scene painted in New York in the 1850s by Regis Gignoux with towering metropolis recorded in Bertram Hartman’s Trinity Church and Wall Street of 1929. Aspects of the American character and regional types are interpreted and recorded in the exhibition in a variety of approaches: with precision of detail and accessory in Richard Creifelds’ The Veterans, 1886, with sensitivity and even reverence in Harry Roseland’s The Blessing of 1905 and as an affectionate caricature in Norman Rockwell’s The Tattoo Artist of 1944. The works selected for the exhibition will reflect not only the varied topographies of the American land itself, but also its influence upon the diverse populations who have come to settle here during the past century and a half. The Brooklyn Museum exhibition, organized by Dr. Linda S. Ferber, will travel under the auspices of the U.S. Information Agencies Arts America Program. Brooklyn Museum Archives. Records of the Department of Public Information. Press releases, 1971 - 1988. 1981, 005-6.